Less than a month after the WSJ reported first that Tesla was quietly asking suppliers for "cash back" on existing and future projects, describing the request as "essential to Tesla’s continued operation" and characterizing it as an investment in the car company, investors quickly sold off the stock sending it back under $300, amid growing fears of a liquidity crisis at the electric automaker. And while those fears were forgotten after the company's "strong earnings" a few days later, and then forgotten even more after the tragicomedy involving the Saudi investment, Elon Musk's take private tweet (with "funding secured" which we now know it wasn't), the biggest problem facing Tesla's ongoing profitability, viability and existence, has been liquidity, or the lack thereof. That problem has also just made a triumphal comeback when in a follow up article, the WSJ reports that some of Tesla's suppliers are increasingly concerned "about the auto maker’s financial strength after production of the Model 3 car drained some of its cash." Specifically, a recent survey sent privately by a well-regarded automotive supplier association to top executives, and seen by the WS , found that 18 of 22 respondents believe that Tesla is now a financial risk to their companies. Meanwhile, confirming last month's report that Tesla is increasingly relying on net working capital, and specifically accounts payable to window dress its liquidity, several suppliers said Tesla has tried to stretch out payments or asked for significant cash back. And in some cases, public records show, small suppliers over the past several months have claimed they failed to get paid for services supplied to Tesla. In an interview with the WSJ on Friday, Elon Musk said that "we’re not behind because we can’t pay them. It is just because we’re arguing whether the parts are right." Still, while the universe of affected suppliers is small in the context of the entire Tesla supply chain, taken together, the survey, interviews and documents show some suppliers are anxious about Tesla’s ability to pay them back. 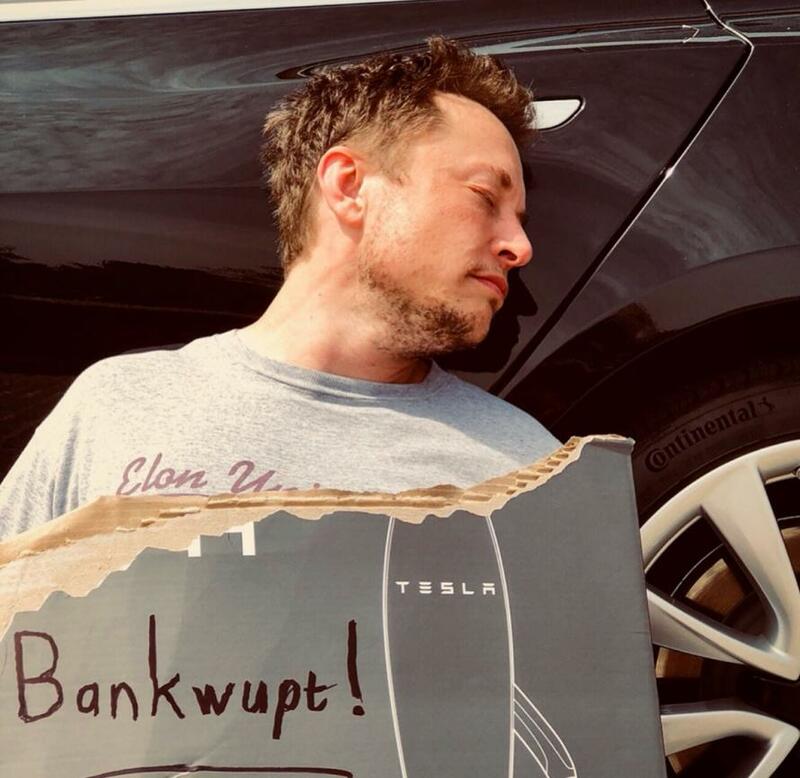 Meanwhile, vendors have finally learned that if Tesla goes bankrupt, their claims will be dumped alongside everyone else in the pre-petition file. And they are not happy. In an attempt to regain control of the discussion, and to steer it away far from Tesla's liquifity, Musk and CFO Deepak Ahuja told the WSJ said Tesla’s financial strength is improving and it remains on track to be cash-flow positive and profitable in the current quarter. They said relations with its suppliers are good. “If there was any doubt in our suppliers in the first place that should definitely be strongly extinguished, with our commentary and our results and the ramp-up of our production,” Mr. Ahuja said. 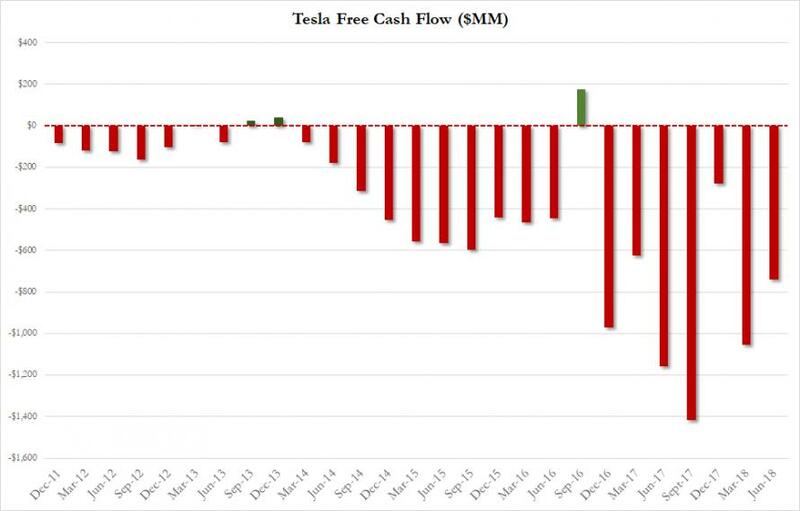 But what perhaps is most interesting in the article is the update on Tesla's current cash pile: as a reminder, on June 30, Tesla reported cash of $2.24 billion, down from $3.37 billion at the start of the year. This number has fallen further, and as of August 12, the company now had just $1.69 billion in cash and equivalents, mostly due to repaying $500 million of a revolving credit line in July. The good news: the revolver was paid down not because the banks demanded it and according to Tesla, it plans to tap that same amount again later this quarter. Then again, it won't be the first time the company has lied in recent weeks. 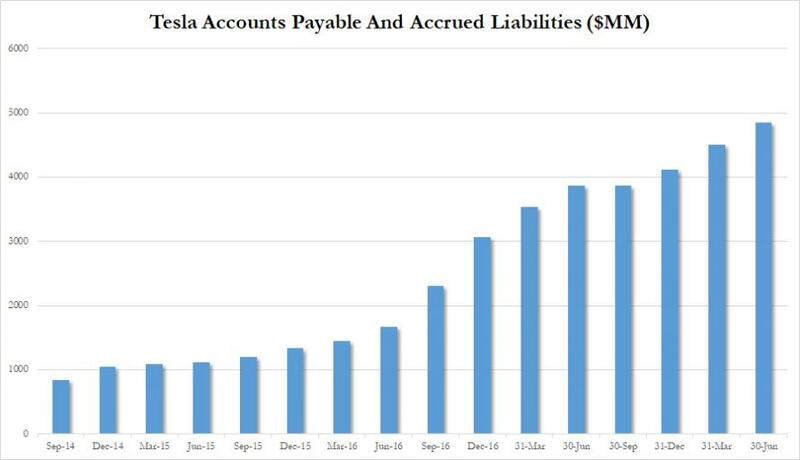 That said, it was not clear how high Tesla's accounts payable had risen in the interim. Meanwhile, the cash flow that Tesla hopes to generate from an increase in vehicle deliveries in the second half of the quarter, is expected to leave it with several hundred million dollars more in cash at the end of September compared with three months earlier, according to the records. That may be a stretch: to conserve cash, as the WSJ reported last month, Tesla has asked some of its capital-equipment suppliers in recent weeks for cash back ranging from 9% to 20% of what the company paid dating back to 2016. In one email to a supplier reviewed by the Journal, Tesla asked for help to make “an immediate impact” by providing a rebate on products already purchased. One parts supplier was asked by Tesla for a 10% reduction on costs across the board going forward, a person familiar with the matter said in an interview. This person said the request was extreme, saying other auto makers typically seek savings of 1% to 2% on individual parts or programs. The supplier said Tesla indicated it would ask to extend the payment terms to 120 days from 60 days if it didn’t get the price reduction, a length rarer among auto makers than a 90-day term. As a reminder, no healthy company tries to blackmail its suppliers. And yet to Tesla it is perfectly normal: Ahuja said it is normal for auto makers to ask for better terms as the business improves. Tesla has steadily lengthened its payment terms over the past few years, and more U.S. public companies are extending the amount of time they take to pay their bills. More troubling is that one of the suppliers said Tesla has stopped making payments to the company since last spring despite numerous promises. This person said he fears insolvency for his own company if he continues to ship products to Tesla and not get paid. Furthermore, as has been reported on twitter in recent weeks, public records show 16 companies since October have taken the unusual step of filing mechanic’s liens—or legal claims seeking unpaid compensation—against Tesla claiming bills haven’t been paid for supplies and services. Previously, only four liens had been filed against Tesla in all of 2015 and 2016 combined. The liens were mostly filed this year in Alameda County, Calif., by small subcontractors against Tesla and contractors of the auto maker, primarily for providing work at the company’s Fremont factory. Some of the suppliers have since been paid, and the total outstanding dollar amount of claims is relatively small, totaling nearly $8 million, according to the documents. “When a customer is having financial issues…suppliers start filing liens to protect their secured position to ensure they are paid,” said Dan Sharkey, a lawyer at Brooks, Wilkins, Sharkey & Turco PLLC who specializes in supply-chain issues. Here too Tesla vehemently denied it was in trouble: Tesla’s CFO "said it would be wrong to see the liens by subcontractors as a sign of financial distress." “It is an issue between the subcontractor and contractor,” he said, adding that it is common practice for subcontractors to name the manufacturer in a lien to create pressure on it. What about the dwead B(ankwupt) word? The OEM Suppliers Association survey found that eight of 22 respondents said they are worried about the auto maker filing for bankruptcy. It was conducted between July 26 and Aug. 8, the day after Mr. Musk tweeted about a plan to go private. He has since revealed a deal is far from complete. In an email on Friday to the Journal, Mr. Musk said, "We are definitely not going bankrupt." Of course, this is the same person how two weeks ago tweeted that a Tesla LBO is virtually assured as the "funding was secured." A few days later it turned out that Musk lied, and his only goal was to "burn the shorts." So why not lie again, especially as the shorts are increasingly getting the upper hand. That's another question the SEC should probably once it finally pays Tesla a visit.